There’s not really much to say here, other than that I never want to see, drive, ride in, or be near one of these rolling tragedies ever again. It’s the size of an LWB S Class, but has less interior space than a 3 Series. It also has a worse interior than a 12 year old Kia Sephia. As far as I can tell, the speakers are merely for show, as increased position of the volume knob only results in an increase in vague suggestions of sound or voice. The AC is...adequate. That’s the nicest thing I have to say about this car. The seats are non-supportive, and seem as if made for a human-sized Mr. Potato. The champagne-colored plastic adorning random trim pieces in the interior is uneven in color and razor-sharp. It’s also god-awful ugly, and doesn’t match the faux-stainless steel plastic adorning yet other parts of interior trim. Both are made of the worst plastic I’ve felt in a car interior from after 1990. The leather is probably tough, but it’s already lost quite a bit of color and utterly worn away in some places. The “wood” trim is the nicest plastic in the car...and looks as if it was printed out from a computer and then painted over with clear nail polish. Feels like it too. And this is just the interior. The handling is theoretical, at best, to steal a line from Car & Driver. You can count to 3 full seconds between the time the wheel is turned and the time the car finally heaves in and takes a set around the corner. But at the same time, requires constant adjustment, as there is so much lateral body movement (in addition to vertical body movement) that the car absolutely does not like to stay pointing the same direction for more than about a hundred feet at a time. You get the feeling that not only was it designed *for* half-blind, half-deaf geriatrics to cruise from their assisted living condo in FL to their doctor’s office, but *by* half-blind, half-deaf geriatrics as well. The brakes are inadequate, although they do finally bite...causing the front of the car to feel as if it’s actively trying to dig a hole into the earth. In short, I’ve never been in a “properly functioning” (debatable here at best) car with less body control, worse steering, or more lackluster brakes. 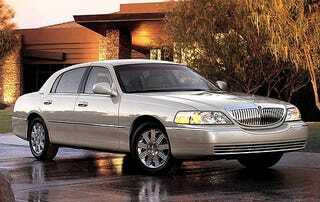 The 4.6 is..medicore at best, which is about all that can be expected from a 4.6 in a Town Car. The transmission shifts well enough, but despite the relative dearth of gears, it still seems confused by such complex requests as “pulling away from a stop light” or “Passing someone on the freeway”. Overall, for the target market (who admittedly has a hard time telling the difference between a drive-thru and a pedestrian), I suppose it’s good enough. But herein lies the rub - this car is vague and soft enough that even someone like me feels the lack of safety in which the car conducts itself. If you have trouble seeing, have reduced reaction time, or other maladies of old age, this car will take those problems and multiply them by 10, at least. This seems horrid for the type of people that will inevitably buy these off the various shady used car lots in AZ, FL, TX, NY, IL, and CA that are overflowing with them. Also...these things were over 40k new. You couldn’t pay me 40k to own this car. The gas mileage isn’t even that great...certainly not much better than a well-driven twin turbo AMG V12 S Class. Which weighs even more and has 2.5x the power. For those of you with a Panther vehicle, who actually enjoy it...I’m glad it works for you. We all have our preferences. But for the love of god, if I ever have to ride in or pilot one of these under sprung land whales ever again...I will simply jump out the window.